The Wuyi Fountain Palm Golf Club is a 27 hole 107 par 7.000 yard course which was designed by Nicklaus. A very typical course for this designer with very generous landing area for tee shots on most holes but most 2nd or approach to the greens will play harder with deep & big greenside bunkers. Most greens are relatively flat or with little borrows, the distance from blue is medium length at 6,424 yards, most tee shots will have little or no long carries over hazards. 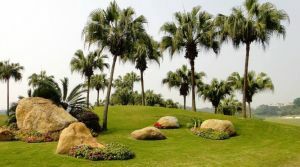 Wuyi Fountain Palm Golf is not yet in our pool of Golf Courses for orders.